Or maybe that should be BIG stack of little squares. 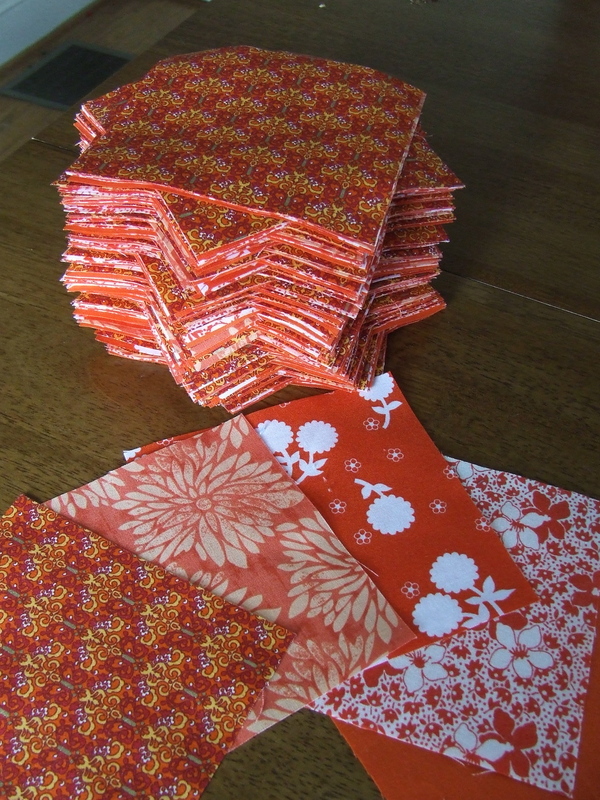 Five inch squares, 280 of them. 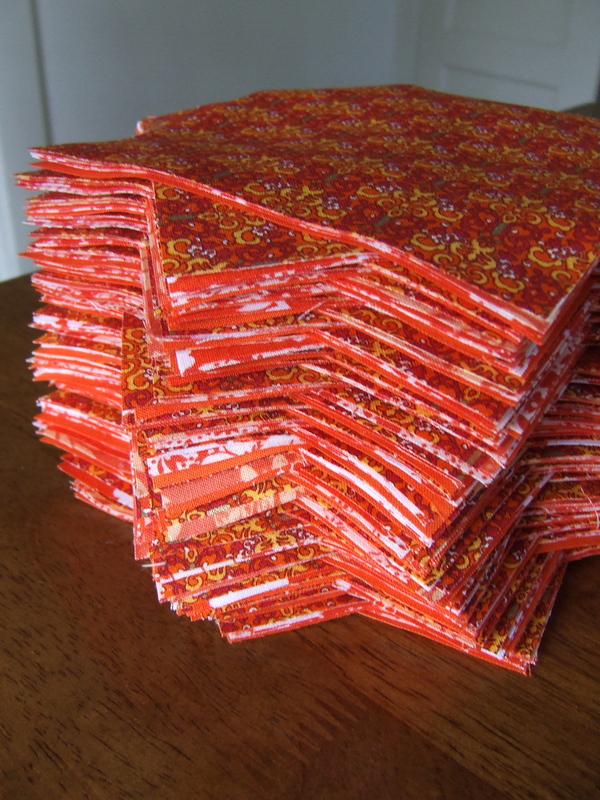 Why, oh, why do I have a stack of 280, 5-inch squares of fabric, all in the red-orange color family? Because I’m going to trade them as part of a fabric swap! 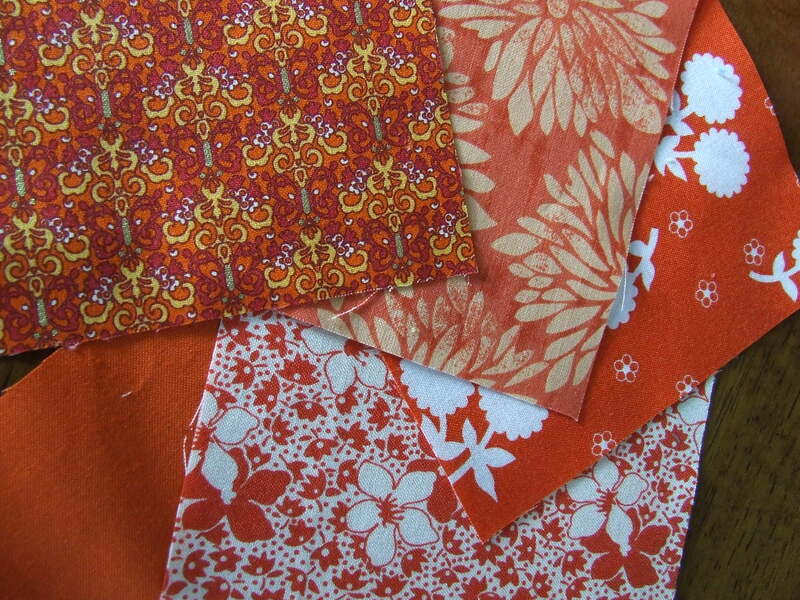 It’s like trading cards for the fabric lover. Kati at from the blue chair organized a monster 5-yard color wheel charm swap. I realize that last sentence may not make sense at all, but I’m pretty excited about it. Apparently, 55 other people are really excited about it too because the available slots for this swap filled up in five minutes. Five minutes! It’s a fabric craze! 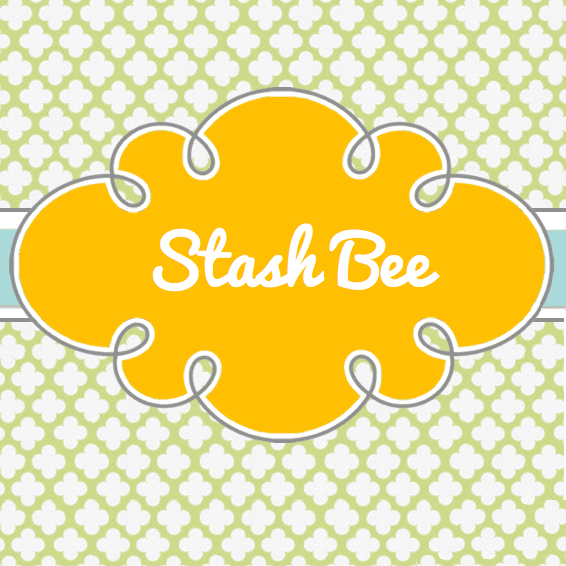 I need to give a quick shout-out to Lyanna at Purple Panda Quilts because she signed me up for the swap since I was in Chicago and didn’t know if I would be able to log on when the swap opened. Without her, no collection of fabric trading cards for me! 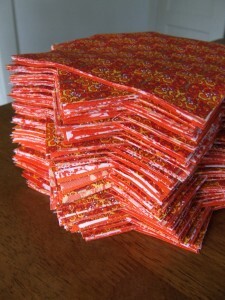 A charm square is a pre-cut 5-inch square of fabric. Fabric manufacturers often produce a charm square pack of a particular fabric line so you can get a little taste of the entire collection. These little squares are great to use in patchwork and quilting. In this color wheel charm swap, there are 56 participants. Each person was assigned a particular color and purchased 5 yards of fabric in that color group. We cut them up into charm squares and mailed them off to Kati. I, obviously, was assigned to the red-orange group. The directions were to purchase 4 prints and one solid in your assigned color. Kati has the massive undertaking of sorting 280 YARDS OF FABRIC into 56 different packages and putting them back in the mail. Yikes. I think I may need to send her a thank you gift for all that work. Phew! Some time next month, I will receive a package with 280 charm squares, five total yards, in all colors of the rainbow, plus black and white. It will be like Christmas in April. Hooray!